More so than just about any other neighborhood in Seoul, Apgujeong drips with money. Even in well-to-do Gangnam it stands out, as it’s here that much of the city’s highest of high-end shopping is centered. This is where you’ll find the twinned Galleria Department Store (갤러리아 백화점), split into two structures that parallel the divide between old money and the nouveau riche. Galleria East (갤러리아 East) is the original half, its design what you’d expect from a typical luxury department store: elegant but hardly understated. Across the street is Galleria West (갤러리아 West), the flashier younger sibling whose signature façade – slate green fish scales in the daytime – is lit up in shimmering multicolored lights at night. For those whose feet tire well before their credit cards, the basement of Galleria West holds Gourmet 494, a food court that makes a mockery of the term. While the words “food court” might call to mind droopy slices of pizza and greasy funnel cakes, you’ll find none of that here. Instead, there are arguably the city’s best burgers from Brooklyn: The Burger Joint, gastronomic ice cream at Fell + Cole, a branch of Itaewon’s Tartine bakery and other outlets of some of Seoul’s top eateries. And, unlike what’s upstairs, everything here is within the Average Cho’s price range. Even more exclusive shopping can be found on Cheongdam Culture Street (청담문화거리), the stretch of Apgujeong-ro that runs east of Galleria, where storefronts read Gucci, Givenchy, Dolce & Gabbana … You get the picture. Mere mortals can instead check out Apgujeong Rodeo Street (압구정로데오거리), actually a warren of small streets and alleys southwest of the station where funky boutiques intermingle with international brands, nail shops and modeling agencies. Adding to the neighborhood’s glam factor, Apgujeong also serves as the nexus of the country’s K-pop industry, home to the headquarters of several of its biggest entertainment companies. On Apgujeong-ro, giant banners drape the outer face of SM Entertainment (SM 엔터테인먼트), home to acts like Girls’ Generation and EXO. A few blocks away, the offices of JYP Entertainment (제와피 엔터테인먼트) (2PM, the Wondergirls) and Cube Entertainment (큐브 엔터테인먼트) (4Minute), stand on opposite corners, and the Dunkin’ Donuts in between is perpetually crammed with fangirls hoping to catch a glimpse of their favorite star. 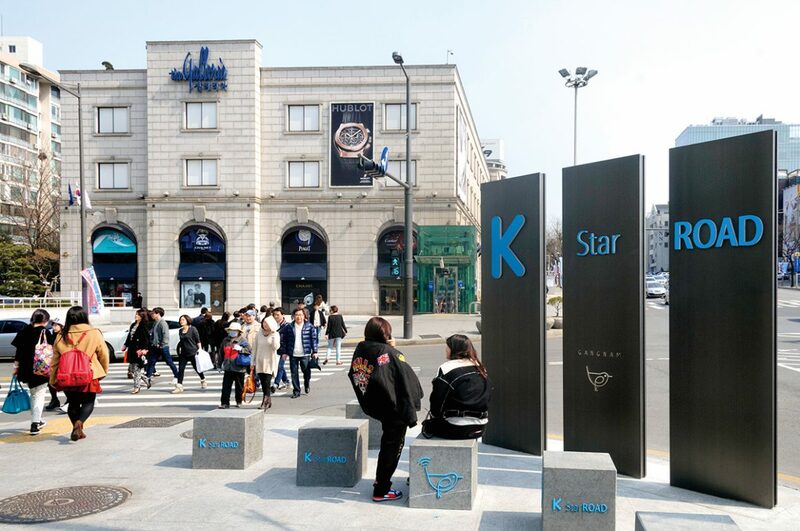 Many of them likely followed the K-Star Road, a self-guided walking route created by the district to link together the various headquarters, filming locations and “hip places loved by Hallyu stars” into a single glitzy pilgrimage. 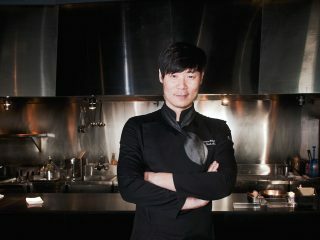 Get the SEOUL Magazine app now for iOS or Android.